My sincere apologizes to the author for taking so long to read this gem. I won this (ebook) through the Historical Fictionistas group on Goodreads from the author when first released. 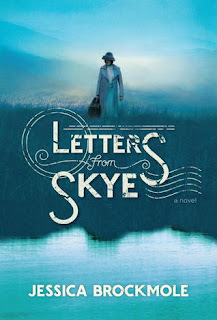 Hearing so many positive comments about Letters from Skye, lots comparing it to The Guernsey Literary and Potato Peel Pie Society, which is a favorite, I knew this one must also be read by myself. Letters from Skye is told entirely through letters. My first thoughts were that this would be superficial - how can one connect with both the characters and the plot? I like my books with depth, where I not just connect with the players and the story but that is unique and engaging at the same time. Also, this book takes place in two different time periods - WW I and WW II, remember all through letters. From the synopsis above you can tell who are doing all the writing, so I won't go over that. So my thoughts on Letters from Skye - I thoroughly enjoyed it! Beginning with the easy banter back and forth between David and Elspeth, getting to know them it wasn't difficult to see where it would lead. With the second story line showing the repercussions, conflicts and fitting conclusion. My fears regarding depth of character and plot were unfounded, through these letters I really got to know not just David, Elspeth and Margaret but others as well. I felt their struggles and the lasting effects these wars had. There were twists and turns here, I little questions I had in the back of my mind were answered. All in all a great debut that kept me absorbed right to the end. This is one I've been wanting to read since it was released, but I've not yet found the time. Maybe 2016 will be the year!